Pets Costs > How Much Does a Praying Mantis Cost? How Much Does a Praying Mantis Cost? 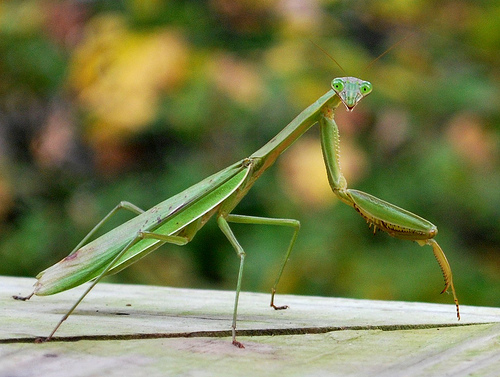 Depending on the species, a praying mantis is going to cost anywhere from $6 to $35 each. The costs will depend on the species, seller and how man you’re purchasing at once. On eBay, there was a handful of “buy it now” listings at the time of this writing. One listing for a Chinese praying mantis, plus free fruit flies and a kit, had a $16 buy it now option, while another listing for a giant African praying mantis had a $20 buy it now option. At Backwater Reptiles, a popular online reptile breeder, they sell their medium to large praying mantises for $25. Praying mantis eggs, on the other hand, can cost $1 to $2 per egg. These eggs can commonly be found online in packs of 10 or more. An insect container with an aerated cover is recommended as a habitat if one wasn’t included. Be sure to add a suitable substrate and branches to mimic its natural environment. This type of container can cost about $10 to $20, but if you are planning to get more than one praying mantis, you will need to buy separate containers to avoid conflict. A heat lamp is recommended for the tank. The praying mantis’ tank should be kept around 75 degrees Farenheight. A praying mantis will feed on feeder insects such as fruit flies, silkworms, rice flour beetles, houseflies or blue bottle flies. Plan on spending $5 to $15 per month, depending on the insects you purchase. Since there’s a good chance you’re going to purchase one online, shipping fees may apply. Depending on the retailer, this can range from $15 to $40. A starter package, if you’re buying on its own, can include the following items: a pet container, mist spray bottle, bamboo skewers, appropriately-sized feeder flies (fruit flies, houseflies, or blue bottle flies), beginner guide and the praying mantis nymph. The average lifespan is about 12 months in the wild and about the same while in captivity. Be sure to verify whether or not the praying mantis species you want is legal in your area. The U.S Federal Law considers these species illegal: the Ghost Mantis, Orchid Mantis, Devils Flower Mantis, Wondering Violin Mantis, #9 Mantis and Egyptian Mantis. If there are insects in the container that the praying mantis did not eat, these should be removed and replaced with live, fresh insects. Some people consider a praying mantis as a pet because of its ability to protect outdoor plants and greenhouse florae. Most species will have wings, but some won’t. Females can’t fly with their wings, but the male can. Be sure to buy USDA-approved praying mantis insects, and do not purchase if the retailer cannot guarantee its legality. Instead of buying a praying mantis container with a ventilated lid, consider creating your own container to save a few dollars. Consider buying a kit that includes everything you need to start taking care of one properly. In order to save money, try to avoid purchasing a praying mantis – try to catch one instead. This may be a challenge because of their size, color, and habits, but the hunt can be both fun and rewarding. I paid 6$ for hundreds of chines mantid’s go on eBay/amazon and search praying mantis egg case.